I didn't think I would understand this class, but I have come out of this class a little smarter, and more aware of cross connections and backflow. BMI offers backflow testing services on a contract basis to water systems, homeowner associations, mobile home parks, and facilities of all sizes. 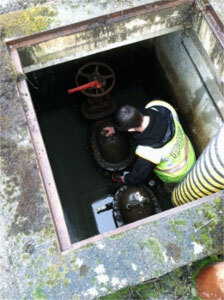 Our Backflow Assembly Testers are certified in Oregon and Washington, and also hold American Backflow Prevention Association (ABPA) certification which makes them able to test in approximately 32 states. Difficult installations, fire systems, and confined spaces are not a problem for our experienced team. We can complete your annual testing quickly and accurately so you can focus on other things. We also offer facilities the dual service of on-site training/testing for your existing certified Backflow Assembly Testers. A BMI representative can accompany your staff through your facility and perform backflow tests while providing in-depth explanation. This is a good option for facilities whose staff lacks experience and may benefit from individual instruction on the actual assemblies they encounter on the job. This option may be especially helpful if there are fire systems, difficult installations or confined spaces to navigate.